Another Pokemon Go update, another datamine revealing all of its secrets. 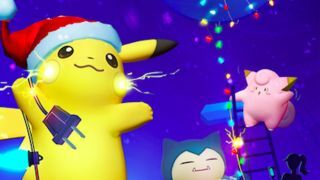 This week, fans of Niantic's mobile spin on the Pokemon franchise have uncovered new trainer customization options, more progress on shiny Pokemon and Pokemon genders, and most curious of all, the addition of presents. Let's break them down, one-by-one. Along with the current trainer customization options, the data from the most recent update for Pokemon Go adds "gloves" and "socks" slots. Mayhaps our avatars won't need to freeze their butts off in the cold, and will be able to bundle up this winter? Shiny pokemon can now be assigned a field number, which isn't a big deal in and of itself. It just means Niantic is making progress on implementing them in a way the game can recognize what they are. Genders have likewise been expanded, and a Pokemon can now be assigned values of "male," "female," or "genderless." Before you go firing up your app, keep in mind that none of these features are currently live. The code is there, but it's either incomplete or not yet active. We'll just have to wait and see when and if Niantic unwraps the proverbial bow.